Register for Let's Torque by submitting your Talking Points. Early bird registration is free, so get in quick! At 11.59 pm on June 7, Registration for Let's Torque will close. In Let's Torque second workshop of 2019: TRANSLATING SCIENCE, we will equip you with the soft skills necessary to better appeal to an audience's emotions in order to convey an idea. The Let's Torque Grand Final returns to the Royal Society of Victoria for another night of top quality presentations by the next generation of STEM communicators. Come along to learn about some of the most exciting STEM solutions and mingle with members of the STEM communication community! Head over to the Let's Torque Facebook page to keep up with the latest. Natalia Zivcic - Brain-Computer interfacing: Magic or Science? The event will be kicked off with some drinks and delicious canapés, followed by a keynote speech from Dr Chris Thompson, Science Communicator and Associate Dean of Education (Faculty of Science) at Monash University. Our fantastic partner Nous will be hosting the final Let's Torque workshop of 2018; STEMployability: Beyond your degree. If you're not sure where your STEM degree could be taking you, how to sell the skills you have developed through your degree, or how to get through the dreaded interview phase, then this is the workshop for you! Senior Nous Consultant, Mark Schultz, will be running this workshop - so get all the insights from a potential future industry. He's also an expert at job interviews, with lots of experience coaching others through this tricky step. Whether you want to pursue a traditional STEM career through an engineering consultancy or a lab position, or want to apply your skills to a new field like management consultancy or business, there will be plenty for you to learn! Our last workshop with PwC sold out, so make sure you get in quick to secure your spot! Get your ticket for $5 at TryBooking. Nous will also be providing nibbles! For Science Week 2018, Let’s Torque and Sisters in Science are joining forces to deliver an exciting panel discussion on a topic that humans have puzzled over for centuries: space exploration. We’ll be asking what humans are doing in space currently, why we’re there, and what we might find. We’ll ponder the implications of humanity entering space and visiting other planets, and weigh up the pros and cons in an interactive dialogue. We’ll also discuss the importance of collaboration in space exploration, why diversity makes us more effective and how we can communicate across the globe to include everyone in the future of space travel. Stay tuned via Facebook to hear about our amazing panellists! Sisters in Science is a student-run organisation which aims to connect high school aged girls with women who work in STEMM fields. Ever wondered where Science is headed? Come along to the Let's Torque semi-finals to find out! This event will see 10 undergraduate STEM students test their communication skills and battle it out for a place in the Let's Torque grand final. • Jun-Ting Yeung - Lessons from The Frog Prince - Why we should kiss frogs. • Madeleine Kemp - Life is "in the bag"? • Sargam Bhardwaj - Optogenetics - The aid from algae and bacteria to cure blindness. • George Loram - Wake up and smell the depression! • Emma Hinde - Can Seaweed save the world? • Tara Graves - Why Do We Laugh? This is a free event with light snacks provided, RSVP here! • Jessica Wolff - A New Green Energy? • Natalia Zivcic - Brain-Computer Interfacing: Magic or Science? Speak with confidence and overcome the intimidating barrier of speakers’ block. Come along for small-group mentoring with experienced communicators who will empower you to use your voice, your body and the stage to engage your audience. Hosted by PwC Melbourne and led by a legendary rock-whisperer, dinosaur-hunter and science-communicator: Prof. Patricia Vickers-Rich. This workshop will also feature small group mentoring and catering provided by PwC. Patricia Vickers-Rich is Director of the Monash Science Centre, Monash University and a world renowned palaeontologist and geologist. She researches the origin and evolution of Australasian vertebrates and their environments over the past 400 million years, and has co-authored at least 10 books, three of which have won major science publishing awards. Patricia Vickers-Rich has been awarded several prizes for excellence in science communication. Late registrations for Let's Torque will close at 11:59 PM on Sunday 3 June. This is your last chance to be a part of the competition in 2018! Transform a presentation from a tedious straight road into a winding journey. We will guide you on maintaining flow and energy. Find out how to design intriguing PowerPoint slides that will leave others to shame. Carlos is a science student with an eye for design. He's spent the past decade solving problems as a visual communicator for clients ranging from MONA to Monash University. He's currently working on an honours project to build sensors that track animals using their eyes. Fergus McLaren is an actor, presenter, scientist and teacher. He is a third year student in BSc. Advanced Global Challenges at Monash University and the 2017 Grand Champion of Let's Torque. You can check out his talk on plastic eating bacteria here. At 11.59 pm on May 6, Early Bird Registration will close. After this date registration will cost $5, so get in early for free entry! Got a science solution you want to share? Learn how to turn science into a story with professional comedian and presenter Alanta Colley and science communicator Dr George Aranda. We’ll equip you with the communication tools to sell science to any audience. Alanta is a comedian (for tax purposes) and storyteller based in Melbourne. She dabbles in science communication, has bees, and regrets. She will be joining us fresh off the stage of the Melbourne International Comedy Festival, where she is performing her show 'Days of our Hives'. Dr George Aranda is a former cognitive neuroscientist who has moved from the world of brains to science education research and science communication. Now researching and teaching at Deakin University, he has broad interests in writing, social networking modes of communication, podcasting, science communication videos and understanding how scientists and their work are perceived in the world. The Grand Final will feature the top 8 entrants from across Melbourne, and will be a fantastic event to showcase their skills to friends, family, and the general public. The Grand Final will be held at The Royal Society of Victoria, with networking and nibbles. We have a selection of judges from a range of backgrounds. There is also a very exciting keynote which will be announced in coming weeks! Secure your early bird ticket here for $5 until 26 September, or $15 thereafter. 4. Tarik Zepcan - Improving the welfare of our sheep, for OUR future! 8. Fergus McLaren - Plastic: a Problem of Consumerism and a Solution of Consumption. Come along to our last semi-final of 2017, judged by Dr Susie Ho! Check out 10 fantastic presentations. Our second semi-final will be based in Melbourne City (exact location TBC) and judged by Terry Mulhern. Come along, have some snacks and enjoy 9 fantastic presentations. 2. Jay Rosenzweig – How can drones keep asylum seekers safe? 6. Zyg Chapman – Two bee or three? 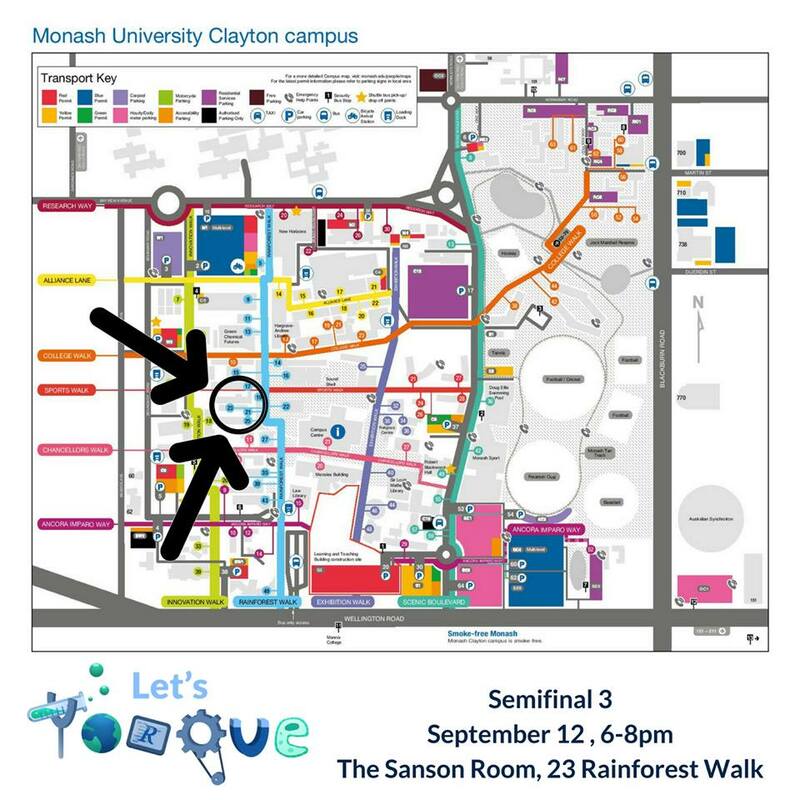 Come along to the first Let's Torque Semi-Final at Monash Clayton to hear about 6 exciting STEM solutions! Come along to workshop 3 with Scientell, a science communication and marketing business! Learn about the essentials of creating a convincing and engaging presentation, with the emphasis on physical and vocal skills to improve your speech. There will be heaps of opportunities to get up and practice! Our second workshop will be facilitated by Lynette Plenderleith, a wonderful science communicator, and hosted by the Let’s Torque team. We will focus on putting together an engaging, entertaining and impactful STEM talk. Master the art of storytelling with a STEM edge! Come away from the workshop able to apply all you have learnt to build your own Let's Torque STEM presentation for the semi-finals! Even if you're not sure about entering, come along and find out what Let's Torque is all about! There are limited spaces available (and our last workshop sold out over a week in advance! ), so get in quick to secure your spot. Go to the TryBooking link below to register your place. We are proud to announce our first workshop is co-hosted with our partner; Nous! Nous Group (Nous) is a leading Australian-owned management consulting firm with over 250 staff across Australia and the UK. Understand the potential of a career in Management Consulting, having come from a science background. Come away from the workshop able to apply all you have learnt to your own Let's Torque STEM solution. Update: This event is now SOLD OUT, so click the link below to go on the waitlist and we will notify you if a spot opens up. Or attend one of our other workshops coming up on 2 August and 23 August.